It is a given that most people would prefer a large diamond. However, there are a few factors that play into how large it appears against how heavy the stones carat weight might be. As one of the basic 4C's of assessing a diamond, it is important to understand exactly what carat weight entails in order to select the perfect stone. The weight significantly affects the cost of the stone since the cost is increased considerably per carat. For example, a 1.00 carat diamond is not exactly half the price of a 2.00 carat diamond. If the weight drops, even if it is only by a few points down to the lower carat weight, the price of the stone will be significantly lowered. *HINT * When looking to purchase a new diamond, try to find one that is as close to the next carat weight as possible. For example, a stone that weighs in at 1.91ct will cost significantly less than another diamond that weighs in at 2.00 and higher even though it is only a difference of 9 points. The difference in size can be extremely difficult to see and the cost will be quite noticeable. Only, locating diamonds in these sizes are quite difficult since cutters will often do whatever possible not to drop to a lower carat weight. A carat refers to the unit measurement used to describe the weight of the diamond. Many years ago, because of their size, the seeds of the Carob were used on precision scales as units of weight for small quantities of precious stones. This tradition continued through time, hence we refer to the unit measurement as carat. Read more about the definition of carat weight and its history. Diamonds that come with a grading report will indicate the exact weight to the nearest hundredth of a carat weight. Each carat is divided into 100 points, so if a diamond weighs 3/4 of a carat, meaning 75 points, its weight would be recorded as 0.75 ct. In the industry, the price of a diamond is often referred to by the price per carat (price per unit of 1.00) and is written as P/C (per carat) as opposed to the overall cost of the stone. Read more about how to read and understand the GIA Certification of Colored Diamonds. Fancy color diamonds are already such a rare find. Needless to say, finding a large stone, especially in rarer colors such as Red, Blue, or perhaps even an Argyle Pink diamond is therefore much harder to come by and will be significantly more valuable. The carat weight and the size of the stone definitely have a lot to do with one another. However there are a number of factors that are different between the two. Regardless of how heavy the diamond weighs, when someone looks at a diamond they often concentrate on the size of the table. Since the table is what everyone other than the jeweler assessing the stone will see, this is the most important aspect of the diamonds appearance. Relative to the diamond boxes shown in the image below, the face value size of each of the stones are quite similar between one another. However, as seen in the image, the carat weight is significantly different between each of the diamonds as a result of the depth of the stones. The image above displays specifically what affect diamond depth has on the appearance of the diamonds shown. From left to right: a 0.45ct stone with a 28% depth, a 1.24ct stone with a 46% depth, 0.56ct stone with a 58% depth, and a 1.14ct stone with a 70% depth. The 0.45-carat, pear-shape diamond in the image above has an extremely shallow 28% depth. As a result, it possesses a very large face value size, although it contains a large window in the middle of the stone. The 1.24-carat, pear-shaped diamond has a 46% depth. This is also quite a shallow stone and it includes a small window in the face of the stone. The 0.56-carat, pear-shaped diamond has a 58% depth, which is closest to the most common norm of 60%. The 1.14-carat, pear-shaped diamond has a 70% depth. With such a deep depth, even though it is 1.14-carats it appears somewhat smaller in size although the color of the stone is a little more intensified as a result of the light being trapped within the stone for a longer period of time. There are times when if a stone includes an external blemish that can likely be removed, or through advanced polishing techniques the color can be maximized, the choice might be made that it is worth taking the risk of putting it back on the polishing wheel. Doing so will most often reduce the size of the diamond, but can result in a higher quality stone. 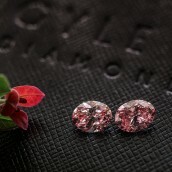 For example, Leibish & Co. was lucky enough to have won six diamonds in the 2011 Argyle Pink Diamond Tender. One of the stones, a 1.71 Fancy Intense Purplish Pink Diamond, was truly a magnificent piece. However, when Shmulik Polnauer, Leibish & Co.’s GIA Graduated Gemologist, bid for this stone it was because he saw something no one else could. Shmulik spoke of the time he spent assessing that stone. Even though it already passed the hands of some of the most experienced diamond polishers in the field, he was convinced that if we won that diamond he could maximize its true potential even further. Upon receiving word that the stone was won, Leibish & Co. took the risk of placing that diamond back on the polishing wheel. 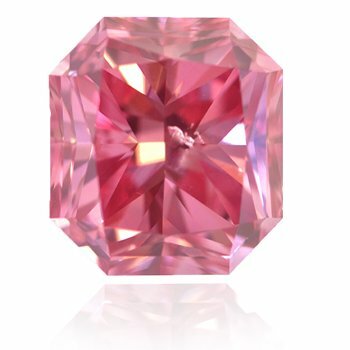 The Leibish Prosperity Pink Diamond was repolished into a breathtaking 1.68ct Fancy Vivid Purplish Pink Diamond. The example given above is specifically why some experienced diamantaires may take the chance of re-cutting a polished diamond. Only three points were lost on that diamond, but the overall diamond quality was significantly improved. Learn more about carat weight vs. quality of the diamond. The piece of jewelry you choose and the setting in which you place the stone will have a significant effect to the appearance of the size of the diamond. Also, certain shapes always look larger than other shapes even though they might be a lower carat weight. For example, an Oval shape will look longer then a Round shape and will appear to be bigger. A Marquise shape, due to the longish look, also reflects a big appearance in comparison to the other shapes. The two stones below look quite different in size as a result of their shapes, but there really is only 28 points between the two! Also, the many variations of the same shape will appear different from one another with regards to the size. For example, the stones below present a different face up value between a Square-cut Radiant, a longer Square-cut Radiant, a Regular style Radiant, and a Rectangular-cut Radiant. Many characteristics affect the appearance of the stone. For example, a colorless diamond that is cut very well, in a way that light can quickly pass through, will actually appear slightly bigger from the sparkle. 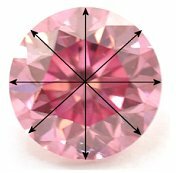 Fancy colored diamonds work the same way, only the cut should cause the light to remain within the stone for as long as possible to help accentuate the color. The four attributes (AKA the 4Cs) define the scientific guidelines of assessing the diamond quality, and therefore define the overall value. However, especially with regards to color diamonds, beauty is always in the eye of the beholder. The carat weight of the diamond does not always determine the size of the stone. There are a number of diamond dimension characteristics that can significantly change the weight while not necessarily changing the size of the table. The table size percentage is the average width of the table divided by the average diameter. Many concentrate on this since it is the section of the diamond we first see. However, the larger the table does not necessary mean the more weight the diamond has. Diamond shapes will vary and as a result, so will the size of the table. For example, while a 1.00 carat round shape diamond has a 6.5mm table on average, a 1.00 carat princess shape diamond, on average, has a 5.5mm table. Read more about the many different diamond shapes. If the depth of the diamond, measured from the top of the table all the way down to the culet, is deep (otherwise known as a ‘fat’ diamond with an obtuse pavilion angle), the measurement across the top of the diamond is often smaller. 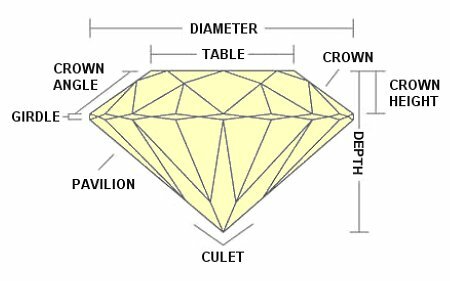 If the diamond has a shallower depth (otherwise known as a ‘flat’ diamond with an acute pavilion angle) the table would then be a little larger. Some diamond culets are purposely left "open" to cause the effect of an open culet diamond. 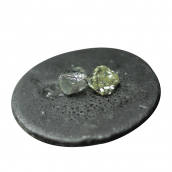 Below is a 1.31-carat, Fancy Intense Olive Yellow Green, Round Brilliantwith an open culet. Have a look at how the minor change affects the appearance of the diamond. A diamond's density ranges anywhere from 3.15 – 3.53 g/cm3 depending on the compound elements inside. A pure diamond is said to be approximately 3.52 g/cm3. The denser the diamond, the more weight packed within. This means that a diamond with the same as another of equal weight can possibly be slightly smaller in size. The carat weight of the diamond is one of the four most important characteristics. However, there are many factors that play into the overall diamond quality. Inclusions found within the composition of the diamonds are most often there to stay. However, in some cases, if the imperfection is on the external side of the diamond there are those with the ability to remove the imperfection through polishing. Furthermore, in a similar procedure some experienced diamantaires will look at a stone and see the ability to maximize the color through repolishing the stone. Read more about the internal and external imperfections of a diamond. 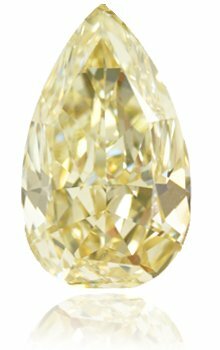 Below are images of a Fancy Yellow, Pear-shaped diamond that Leibish & Co. modified. 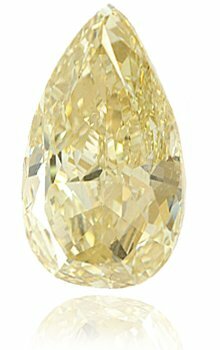 The stone was originally an 11.24ct, Fancy Yellow Diamond with an SI2 clarity grade. The stone was corrected to a 10.79ct, Fancy Yellow Diamond with an IF clarity grade. Click the GIA diamond certificates below for a closer view. Still, since nine times out of ten it will reduce the weight, and there is always a risk when putting the diamond back on the polishing wheel, there is a lot of consideration that comes into making this type of decision. The diamond can potentially shatter from within which will completely destroy the outside appearance. Meaning, in the blink of an eye, something worth thousands of dollars can easily drop to hundreds or even less. Below are some more amazing examples of some of the modifications Leibish & Co. has made with our stones. With this Fancy White, Hear-shaped stone, two points were lost through repolishing the stone. However, as can be seen in the images below, the shape was better crafted which increased the value of the diamond. The 0.60-carat, Fancy Vivid Blue diamond below is a superb example of why many "gamble" with sending a stone back to the polishing wheel. The shape of the diamond was improved and absolutely no carat weight was lost in the repolishing process. Needless to say, the value of the stone was significantly increased. As mentioned previously, sending a diamond back to the polishing wheel is quite risky. The image below depicts a beautiful Radiant-shaped, Light Pink Diamond that was shattered from within. As a result of the rarity of the color, the stone still has a significant value, only compared to a higher clarity diamond of the same shape, size, and color it could have potentially been worth a lot more. Still, like so many other things in life, in order to gain, you sometimes need to gamble. A great example of this was when Lawrence Graff acquired the Wittelsbach Diamond, which later became the Wittelsbach-Graff Diamond at auction in December 2008. 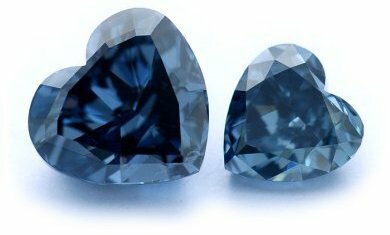 The stone that was purchased was a total weight of 35.56 carats, Fancy Deep Grayish Blue with a VS2 clarity grade. Besides wear marks, it was chipped and it had an extra large culet. In 2010 Lawrence Graff announced that he had made the very risky decision to polish it down to 31.06 carats and managed to change not only the clarity to an Internally Flawless but also to improve the color to Pure Fancy Deep Blue with no grayish overtone.